Latics boss Paul Cook reckons referee Stephen Martin will be "embarrassed" when he watches back the decisive goal which gave QPR victory over Wigan Athletic. 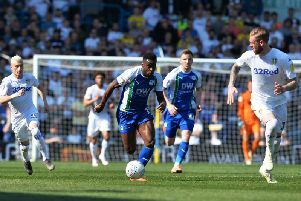 Latics defender Chey Dunkley appeared to be pushed in the build up to Tomer Hemed's strike but, despite his colleagues telling him otherwise, the official waved away Latics players' appeals for a foul. In his post-match interview with reporters, Cook remained relatively calm, describing the decision as one that "changed the game", but to club media and Wish FM, he was a little more critical. "The referee has to watch them decisions back and he has to then justify why all the other officials have told him it was a foul and he doesn't give a foul," he said. "I think he'll be quite embarrassed when he looks back at it. "But that's the game isn't' it, he gives them decisions because he believes they're right. The other officials have told him a foul and we get that decision. "When you watch it back like we have done it's not a very good decision by the referee but I'm not going to start complaining about it because it's every week now where you're speaking to Dave Allison (national group manager of the Professional Game Match Officials) about referees and all we're asking for is them to be better with the key moments in the game. Everyone else can decide with the key moment in the game and whether he got it right or not." Wigan dominated for most of the 90 minutes but failed to break down a resilient QPR defence with Hemed's controversial goal proving crucial.